3) according to aforementioned PhD friend, it has "Russian constructivist editing, starting at around 7:44." I ask you, how often are those elements combined? and eventually a shot of said woman and child, whom the plot summary on imdb tell me are Jeetendra's wife (Sridevi) and child, whom the bad guys have abducted and imperiled thus. Okay, so maybe those images aren' t that unconnected. 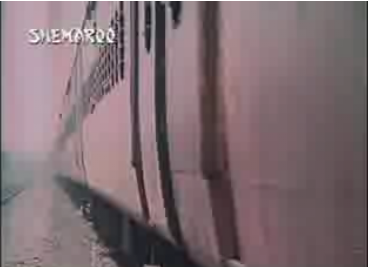 Even if you don't read the plot summary, it's pretty clear that Jeetendra is thinking about that train track as he beats up Shakti (who no doubt has it coming - he always does, no? ), handcuffs him to a tree, digs a circular trench around the tree with his foot (yes! awesome! 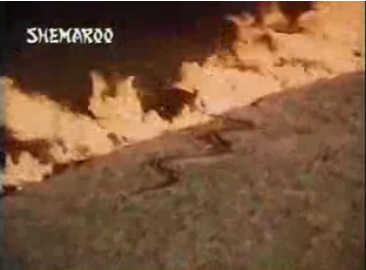 ), fills the trench with kerosene, lights it, and then tosses a cobra into the ring for good measure. The cobra, for its part, is pissed; Celi thinks it is probably as little fond of Shakti Kapoor as we are. Wondering if Sridevi fares better in earlier, less penultimate-fight-scene-looking segments of this film, I tried part 1. Fantastic! 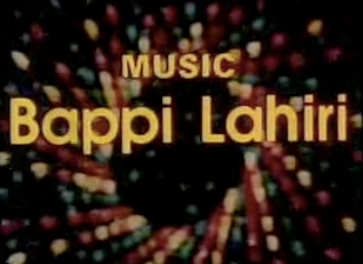 Just look at this combination of 70s-masala-style lettering with disco background! And then a switch to very 80s text. It reminds me so much of the CBS special introduction clip from the early 80s, always a harbinger of treats like Peanuts holiday specials. Well duh. Like you couldn't tell that from the combination of 70s brass and 80s pew-pew synthesizers. Memsaab, have you seen this? Sridevi enters the films as soon as the credits roll, bursting into Jeetendra's police station holding one end of a piece of rope to whose other end is tied a child. Yeah. I don't know either, and I don't think I'm going to try to find out more. 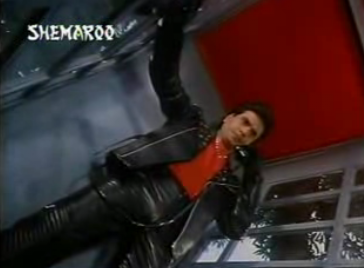 Shakti Kapoor in a leather latticework top is more than enough to keep me away. 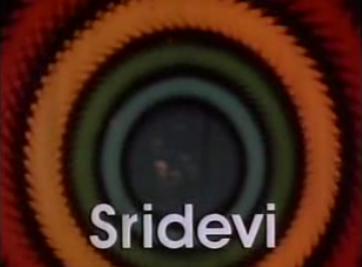 I have one more random youtube spelunk clip left and I hope it really features Sridevi. 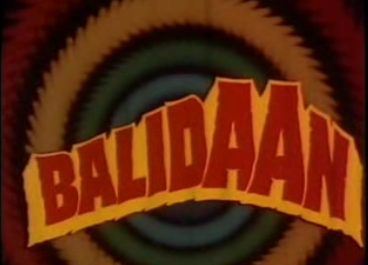 Until the numbers roll in my favor, I'll just enjoy all the other Sridevipalooza projects...and the snake dance from Nagina, which I cannot believe I have not remembered to re-watch until just this very second! 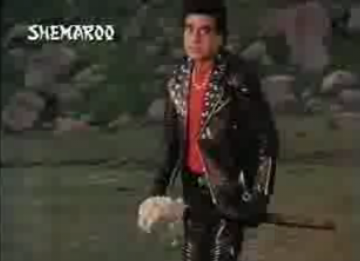 Maybe Jeetendra's cobra would like to join me. 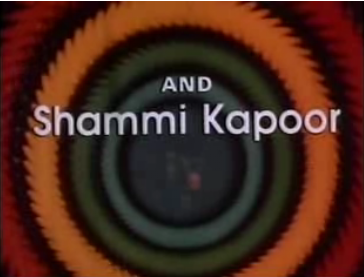 I have, curiously, run into Shammi quite a lot during Sridevipalooza. Must have been the era, I suppose. LOL Beth!!! I loved those Charlie Brown specials! When I was little and my parents watched Indian movies...I would cry (so sad, so dramatic! )...and your clip reminds me of why. Yesterday at work, I helped a woman whose name was Sridevi. It was all I could do not to squeal "OHMYGOD, do you know there's a Sridevipalooza going on RIGHT NOW?" But alas, I remained professional. 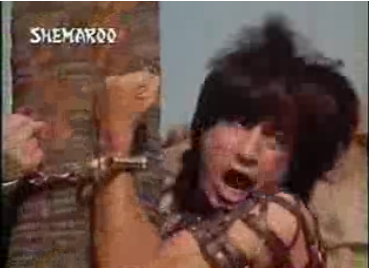 I do not think that 80s Shammi can win against Shakti Kapoor in latticed leather. Sad, but true. Early 60s Shammi maybe. But not 80s Shammi. actors and actresses being revered like a God is nothing strange in Tamil Nadu, where I hear there is actually a temple, with daily worship services for the former actress, former chief minister Jayalalitha.